Whilst the RV Friendly scheme is an initiative of the Campervan and Motorhome Club of Australia Limited, the NACC urges all club members to support this initiative by making these towns and destinations places to stop, shop and stay. Many of the RV Friendly towns and destinations depend on the RV travellers for their survival and the support of club members can contribute to their long term future. If efforts are not made to support such places, then in the future they may not exist which would be detrimental for all concerned. The RV Friendly Town™ Scheme is a CMCA initiative aimed at assisting recreational vehicle tourists as they journey throughout this wonderful country. This includes motorhomes, campervans, caravans and 4WDs. An RV Friendly Town™ is one that has met a set of guidelines to ensure they provide a certain amount of amenities, and a certain level of services for these travellers. When they enter a town displaying the RV Friendly Town™ sign, they know they will be welcome, certain services will be provided for them that may not be available in other centres, and they will have access to a safe place to stay overnight and for a longer period. How does a town qualify? Provision of appropriate parking within town centre with access to a general shopping area with groceries & fresh produce. Provision of short term (24/48/72+ hour) parking within reasonable distance to CBD. Provision of long term parking, to be at a reasonable rate commensurate with the requirements of self-contained vehicles. Access to medical facilities or an applicable evacuation plan. Access to a Dump Point, if not in town, within a distance of up to 50 kilometres from town. A service centre able to provide basic vehicle repairs. Visitor Information Centre (VIC) with appropriate parking facilities within a reasonable distance. VIC to provide a town map showing essential facilities such as hospital, medical services, fuel, shopping area, dump point, fresh water etc. Provision of appropriate parking within the town centre with access to a general shopping area with groceries & fresh produce. Provision of short term (24/48/72+ hour) parking within reasonable distance of the CBD. Access to a medical evacuation plan such as a Flying Doctor Service or an ambulance in a nearby town. A procedure to obtain pharmaceutical products (may be by delivery). Access to a Dump Point, if not in town, within a distance up to 50 kilometres from town. Council to provide one person as contact. 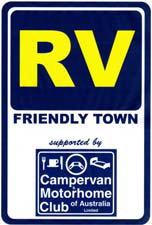 RV Friendly Location™ signs to be erected within the town precinct. An RV Friendly Destination is a “one-off” place of interest, such as a homestead or country pub, that is friendly towards all mobile travellers. They are generally business where you can visit in any size rig and in many cases, stay overnight. You can read or download a list of the Dump Points for each State by selecting the PDF link. This link will re-direct you to the CMCA web site where you can view the RV Friendly Towns and Destinations on an interactive map. Link provided courtesy of CMCA.